This first question comes from a national production studio that is developing a documentary on Tlingit culture. Question: What are the Tlingit views about death and an afterlife? 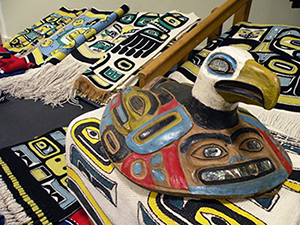 Rosita Worl: The Tlingit believe that we have spirits or duality of spirits—one aspect remains at the burial site, which is why we work so diligently to protect our burial sites. Most notable are shaman burial sites. I was engaged in a 40-year battle to protect Indian Point in Juneau because the spirit of a shaman remains at the site. The federal government wanted to build a facility there, and they explored different options with us, including the idea of building a fence around the burial site. I responded that I didn’t know if a fence around the burial site would contain the spirit. The federal government offered us $1 million if we would drop our opposition. We, of course, declined. We threatened to use every political and legal tool at our disposal to protect the site. The government eventually withdrew and built the facility on a different site, and in 2016, the feds recognized Indian Point as a historic place. The spirits of our ancestors also manifest themselves in our clan at.óowu—our sacred treasures. We bring out our at.óowu at ceremonies to invoke our ancestors’ spirits (right). That’s why we say our at.óowu has spiritual dimensions. We believe our ancestors’ spirits are with us when we display our at.óowu at ceremonies. When an individual dies, we say they “Walked Into the Forest,” a liminal space for us. You can also see the Spirits of our Warriors when Northern Lights appear in the sky.